We can also cook large fish pies to order. Just pop in with your pie dish. Call us today to cost out your perfect special occasion fish item. The Fish Shed can post out smoked salmon and kippers with next day delivery. For more details, pricing and postage rates contact the shop today. £5, £10, £20 and £50 vouchers are available in store. The Fish Shed staff can make seafood platters or cook and dress a whole salmon for any special occasion. Platters are made to order for no extra cost. 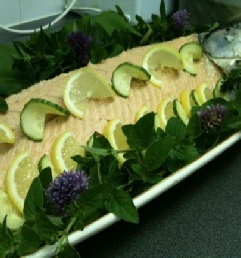 Salmon cooked and dressed for a small service fee.